st. patrick’s day – i can dig it. after all, a good chunk of my ancestors did come from ireland, which is probably no surprise to any of you. after all, my last name is donovan, i have the telltale auburn hair / tan-resistant porcelain skin, + i grew up in boston, alongside lots of other irish-named folks. so, in honor of st. patrick’s day next thursday, i bring you this amazing dessert: chocolate guinness pudding with guinness vanilla whipped cream. that’s right! this dessert is amazingly delicious + gives a nod to ireland with its use of guinness in both the pudding + the whipped cream. let me be completely honest with you – this is not diet food, nor is this a light pre-dinner snack. this dessert is unashamedly rich + decadent. as you know, i am not usually a huge sweets person, but i could not stop eating this stuff. it would be the perfect addition to your st. patrick’s day menu, or delicious by itself with a little bit of jameson or bushmills whiskey to accompany it. happy st. patrick’s day! in large nonreactive mixing bowl, whisk together egg yolks and sugar. open can of guinness and slowly pour into 4-cup measuring cup, pouring down side of cup to reduce foaming. pour half of guinness (about 7/8 cup) into heavy-bottomed 3-quart saucepan. add 2 1/4 cups cream + whisk to combine. set over medium heat + heat, whisking occasionally, until bubbles just begin to form at edges. remove from heat, add chocolate, + whisk until smooth. slowly pour hot chocolate mixture into eggs, whisking constantly to prevent curdling. return mixture to saucepan + set over moderately low heat. cook, whisking constantly, until mixture thickens + coats back of spoon, about 15 minutes. (pudding will look separated.) pour into blender + blend on high for 1 minute. divide pudding among glasses, leaving at least 1 inch of space at top of each. cover with plastic wrap + refrigerate until chilled and set. meanwhile, pour remaining guinness into small saucepan + bring to boil over medium heat. reduce heat to moderately low + simmer, uncovered, until reduced to 1 tablespoon, about 20 minutes. pour syrup into small bowl and let cool. beat remaining cream until soft peaks form. add guinness syrup (**note: i found the guinness syrup to be a bit intense, so rather than use all of the syrup, i used 1/2 of the syrup along with an equal part vanilla extract, which was perfect) + beat until combined. divide cream among 6 glasses of pudding + serve. Amy – I LOVE this idea. I will have to try this on St. Patty’s Day. Thanks for the recipe. thank you! when i stumbled across the recipe i knew it was a must-try. it is sooo delicious (+ super rich). perfect for st. p’s day! OK so that looks fantastic! aww, thanks! i love that it looks a little bit like a beer itself, with the brown body + ‘foamy’ looking top layer. you’ll have to try it! This sounds fantastic! I’m not a fan of Guinness by itself but put it in a dessert and hello! 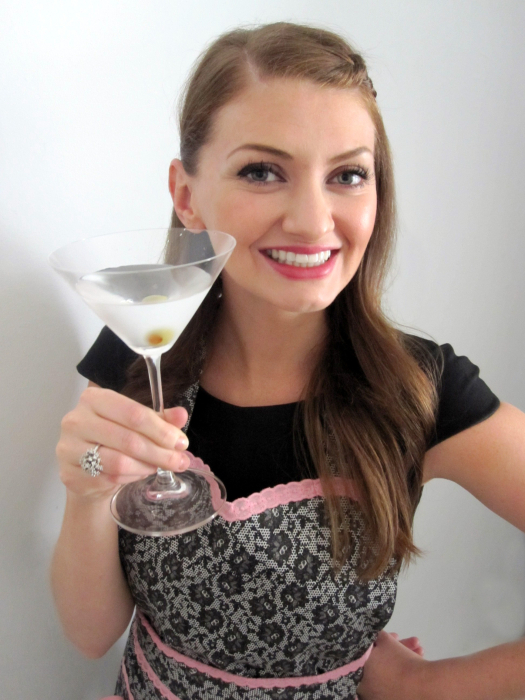 Cute how you put it in a cocktail glass, too! thanks, leah! 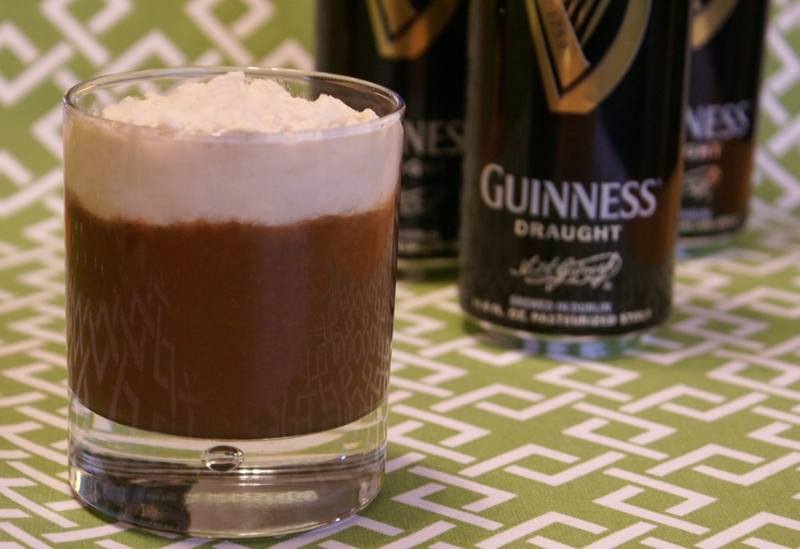 since you don’t like guinness by itself, if you decide to make this, skip the guinness syrup in the whipped cream. it reduces to a super guinnessy flavor (that was intense even for me, a guinness lover) so you probably wouldn’t like it. regular sweetened whipped cream would probably be more up your alley! Not quite as bland, potato-y, or cabbage-y as most Irish-inspired creations. Not that those aren’t good–I’ll certainly be celebrating with soda bread and cabbage this week. This yummy treat would make my celebration a little more interesting, though! i’m with ya. i love cabbagey irish meals as much as the next donovan, but they don’t pique my interest as much as boozy chocolate pudding. i bet your soda bread will be delicious — enjoy! What a nice endinng for our corned beef and cabbbage dinner this Thursday! mmm, sounds like a great dinner on thursday, + the guinness pudding would absolutely be a wonderful ending to it! Amy, I saw this post a few days ago and lost my “bookmark”. I sent a request into my Twitterverse this lovely St. Patrick’s Day morn for this recipe and @CampbellKitchen found you for me. How wonderful! yay! i’ve been off twitter for the last few hours otherwise i would’ve seen your tweet + linked you up. good for @CampbellKitchen for finding it for you! i can’t wait to hear what you think of it! you might want to read through some of the previous comments — depending on how much you like the flavor of guinness by itself, you may want to adjust the amount of guinness syrup in the whipped cream. enjoy! I made this tonight and followed all the directions to a T…is there any reason it would remain a complete liquid? The taste seems like it would be delicious…. I’m so sorry to hear that it didn’t set for you, kristina! i’ve never had that problem with it before. i did go back to the original source of the recipe, + read through the reviews. while most are really positive, a few of the reviewers did mention having the same problem, with the pudding not ‘setting.’ did you, by any chance, use half-and-half instead of heavy cream? one reviewer did that + said it didn’t set. another person said they had problems with it setting, so they added 1/4 cup of cornstarch + that did the trick. I confess, I don’t remember exactly how long I let this set in the fridge – probably a couple of hours? It definitely didn’t take overnight, if I recall – just a couple of hours. Sorry, I wish I remembered better!